Crooked Slide Park, located 3 km from Combermere on Old Barry’s Bay Road, is irresistible to photographers, both amateur and professional. 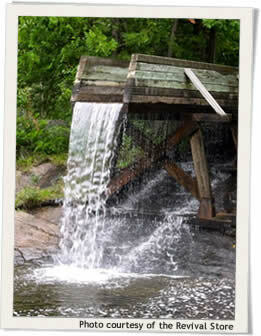 Its uniqueness is attributed to the reconstruction of an original log chute on Byers Creek which was used by loggers in the early 1900s to float logs from the Hopefield, Brudenell, Rockingham, Wilno and Barry’s Bay areas down to the Madawaska River. There are three or four bends in Byers Creek at the mouth of the log chute and when the logs were going through these narrow bends, they would jam up. In order to prevent this, the chute was built and water was diverted through the chute by closing a control dam. The logs would float approximately 220 feet in the chute and then fall 10 feet, back into the creek. From there it was clear floating to Combermere where they emptied into the Madawaska River. Murray Bros. Lumber Company of Barry’s Bay generously donated the six-and-a-half acres of land that were used to build the chute and park area. The chute was first reconstructed in 1973, and then again in 1994 after it had deteriorated. **Photo courtesy of the Revival Store.